Editor's note: Rebecca Byerly has spent the past year working in environmental education in India. She also has taught in Egypt, Sudan, Turkey and Afghanistan. She grew up in North Carolina and has run marathons in various countries around the world. XINJIANG PROVINCE, China (CNN) -- It was while running, walking and sometimes merely shuffling for 250 kilometers (155 miles) across the Gobi Desert that I learned what motivates people to reach the finish line and complete a physical and mental challenge. The Gobi March is a six-day stage race across the Kizilisu Kyrgyz Autonomous Prefecture of China. Earlier in June I joined 172 other participants from 29 countries in the Gobi March, a six-day stage race across the Kyrgyz Autonomous Prefecture of China, a remote area in the extreme southwestern part of the Xinjiang Uighur Autonomous Region. Battling dust storms, searing heat, miles of rocky riverbeds, and seemingly endless desert terrain, all of us tested our months or years of preparation. Carrying all of our own survival gear except tents, our days were marked by checkpoints and journeys through Uighur and Kyrgyz towns. The need for showers and standard toilets were replaced by more imminent concerns such as taking care of our blistered feet, staying hydrated, looking after a fellow runner or trying to get sleep in a tent full of snoring competitors. 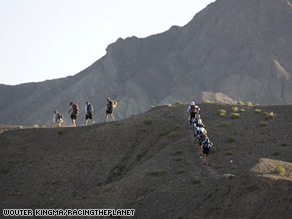 The Gobi March was part of "RacingThePlanet," an organization that stages a global series of 250-kilometer, self-supported footraces across four of the world's deserts each year. "Through my love of sports, the outdoors, and primitive cultures, I dreamed of creating a global sporting event that would take people to some of the last remaining pristine landscapes and ancient cultures on the planet," said Mary Gadams, who started RacingThePlanet in 2002. "These events were always meant to be one of the most remarkable journeys on Earth and I believe that anyone who takes on the challenge will never be the same." Traversing the paths of the ancient Silk Road in China's last frontier, I saw nomadic houses in the middle of the desert with solar panels, passed herds of camels, and said "As-Salamu `Alaykum," (an Arabic greeting) to the awestruck people in the towns we passed. It was often hard to imagine we were in China; the Uighur and Kyrgyz people use Arabic script and are primarily Muslims. Though I am a relatively experienced ultra-runner I spent the first four days of the race with the heroes at the back of the pack. I learned that the real story about this kind of event is not the quick times of the front-runners, but the courage of the people running or walking at their absolute limit and adapting as Mother Nature or their own inexperience lays down the gauntlet. "I always do things the hard way," grimaced Kenneth "Tin Tin" Johansson, a 43-year-old professional athlete from Sweden. Due to the heat, rough terrain, and ill-fitting shoes he had already lost two toenails the night before and the sole's of his feet were a waste land of raw flesh. Barely able to walk he never complained and bravely climbed to Heaven's Gate. More accurately called Shipton's Arch it was first made known to the world in 1947 when English explorer Eric Shipton mentioned it in his book "Mountains of Tartary." Nearly 1,200 feet tall, or roughly the size of the Empire State Building, the arch was a beacon for Tin Tin and I to get to the top of the mountain. "This is good training for climbing Everest," joked Tin Tin with a forced smile as we paused to look at the stunning mountain views. The Gobi March was his second 4Deserts race. He planned to complete all four and climb Everest in one calendar year. Several competitors had already dropped out due to dehydration or other injuries and a Danish runner was medevacked to Hong Kong after suffering from a heat stroke. Tin Tin finished the day's race but was then rushed to the hospital due to chest pains, caused by muscle breakdown from the heightened stress his body endured. During this race I had to relearn a lesson often forgotten: a sense of humor is quite possibly the only way we can persevere through the extremes. It was the youngest competitors and the only brother-and-sister duo Americans Julia Metcalfe, 21, and Max Metcalfe, 19, who best demonstrated the power of laughter. Julia told me her turning point was when Max pulled out his harmonica and began serenading her. For others it was the spontaneous cultural exchanges, which gave them the extra push they needed. Paul Moran, an Irishman's first words after the 50-mile day were " Total Carnage." He then burst into laughter as he recalled the Uighur woman who followed him on her donkey singing him on. One of the most memorable moments for me was walking with Carlos Dias the first day of the race. Sponsored by Croc shoes, the 35-year-old Brazilian ran 9,000 km across Brazil in 100 days wearing Crocs last year. The Gobi March proved to be his greatest athletic challenge. When I passed him at the final checkpoint he was dehydrated and vomiting. With only 10 km to go we walked the final leg together. Though we do not speak the same language, the grounds of our conversation were material for a sitcom. We talked about sun-showers, his career test-driving crocs and our desire to hitchhike back to camp via camel. I think everyone had moments in the race when we either laughed or cursed that we paid to enter the event, were miles from nowhere, being followed by camels, and if injured in some areas donkeys were the only way-out. One can only imagine what the local people, who in many cases had never seen foreigners, must have thought about us. A Kyrgyz man said, "The only thing we know about running is chasing after our sheep and goats." RacingThePlanet gave books to schools in the area and raised about $30,000 for China's earthquake victims. Many of the race participants also raised money for various charities. For some runners such as Doreen Huffman, 47, a lawyer in Detroit, who had open heart-surgery 10 years ago, the objective of this race was not about finishing but the opportunity to participate. "For me the race is about being in the Gobi Desert with this group of people, seeing the culture, and experiencing this extreme sport." Of the 173 competitors who participated in the race, 27 did not finish (DNF). Dr. Brian Krabak, the medical director at the race attributed most DNF's to dehydration, blisters, and exhaustion. He recommended that runners try to simulate the terrain they will traverse, stay hydrated, lubricate their feet, and monitor their health. The winner of the Gobi March was Ryan Sandes a 26-year old South African, followed by runners from Hong Kong and Chile. Lia Farley a 38 year-old California native led the pack for the women and finished 8th overall. Dean Karnazes, author of "Ultra Marathon Man," a best-selling book finished 4th overall. "Sure there are blisters and pain in this sport, but the most important part of the race is the instant bond which forms between people," said Robert Hutchinson, a 66-year-old American living in Hong Kong. Sleeping shoulder to shoulder without showering for nearly a week, the people in my tent became family. The total time difference between the fastest and slowest competitors was 52 hours, 8 minutes. For most of the runners their time and place in the race was irrelevant, but the impression it left was lasting. "Receiving a finishers medal at the end of this race is the equivalent of an Olympic Gold for many of the competitors in this event," said Dean Karnazes.